Apple Day in Stroud went ahead despite a dire harvest in our local orchards as Stroud Apple Town organised a weekend of apple-y festivities. Sadly the usual Whiteshill and Ruscombe event didn't happen due to so few apples but elsewhere many events still took place (see film of last year here)....Click here for a report by District councillor Andy Read and below is one from Stroud Valleys Project. Stroud Valleys Project Green Team volunteers helped with endless apple chopping and crushing to give locals a chance to taste freshly-pressed apple juice, as well as providing 10 heritage varieties for tasting, a 'mystery apple' game and 'guess the apple weight' competition, while the Dead Dog Cider duo entertained the crowds. More juicing happened at the Farmers' Market and the Museum in the Park, and over 50 heritage Gloucestershire apple varieties were on display at Day's Cottage market stall. SVP Biodiversity Officer Ivi Szaboova said: "We didn't let the apple shortage put us off celebrating our rich apple heritage. 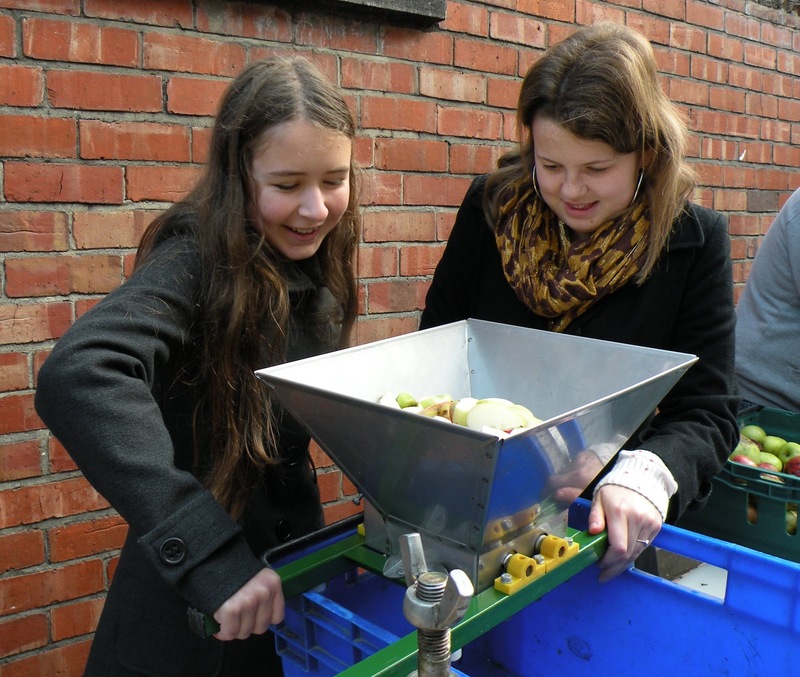 People loved trying different kinds of Gloucestershire apples, comparing tastes to help choose varieties for their gardens, as well as tasting apple juice fresh out of the press. We had requests for seconds and thirds, with comments about complex, refreshing flavours not ever found in shop-bought juice, and teenagers swapping fizzy drinks for apple juice." "The apples came from Day's Cottage fantastic traditional orchard, full of heritage varieties grown without chemicals, and we used this opportunity to educate people about food miles as well as the importance of wildlife gardening. Advice on attracting bees, solitary bees and bumble bees into urban gardens was much appreciated as people were shocked by this year's abysmal harvest, and shared story after story of just a handful apples (or none!) on their usually prolific trees. This appalling harvest possibly opened our eyes to the significance of pollinators, without which we'd struggle to feed ourselves - about a third of our food depends on pollination - as well as reminding us not to take the usual abundance of apples for granted." See also film here from earlier this year re Horsley orchard. Our spectacular fruit harvest this year consisted of one solitary plum. The apples didn't even make a token attempt!